Min Luna is one of the most well known stylists and fashion gurus in Malaysia. She is known for styling a swathe of local celebrities and having an impeccable fashion sense. So it’s no surprise that she brought her signature style and character to this year’s KL Fashion Week. Min Luna x Fashion Valet brought us a collection under the hashtag #NotFragile. The collection was about breaking stereotypes and embracing your body as it is. Min Luna x Fashion Valet was opened by local feminist and body positivity influencer, Nalisa Amin. She looked gorgeous in an orange/red jumpsuit, with her curls on full display. 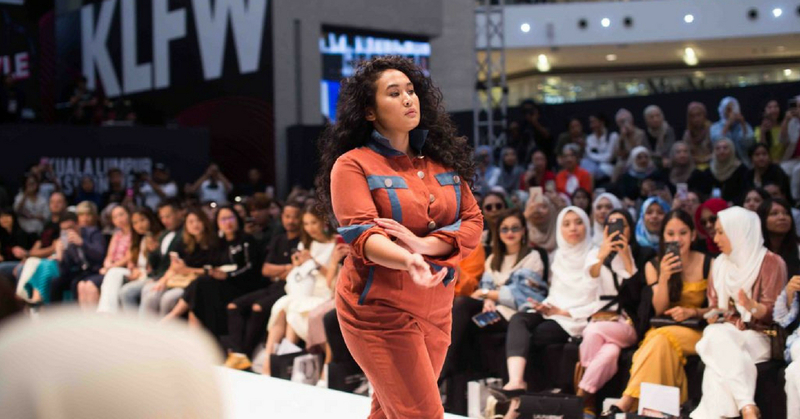 She was the first plus-sized model to to both open a show and open KL Fashion Week, making it a doubly amazing achievement. Another star on the runway was local model Sonya Danita Charles. Sonya lives with vitiligo, which leaves parts of her brown skin covered in pale white patches. On the runway, she rocked a beautiful outfit and an oversized hat. The collection was meant to celebrate diversity of body types, skin types, and ages. To empower women from all walks of life by showing them that they too, were beautiful and worth the runway of a fashion week. The fact that Min, who is known for her work with celebrities is giving these women a platform both literally and figuratively speaks volumes. In an age where women still face massive amounts of scrutiny for everything from what they wear, what they eat, what they look like, how old they are, who they know, and where they go, it’s wonderful to see such a prominent and influential woman supporting diversity and body positivity locally at this scale. So what do you think, dear readers? Did you see her collection? Which outfits are your favourite? What do you think about the steps taken towards body positivity and acceptance locally by women such as Min Luna?